The period bindings of the three-decker, 1813 first of Jane Austen’s Pride and Prejudice that sold for £38,000 by Mellors & Kirk. 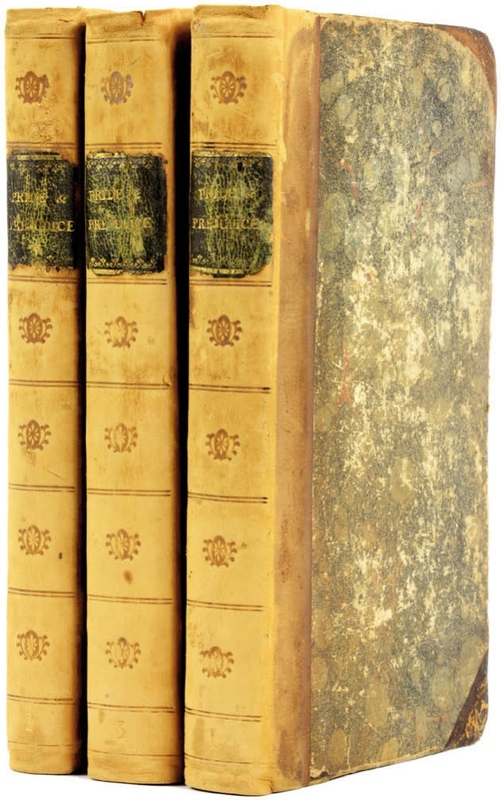 This three-volume copy, in now slightly rubbed half calf and marbled boards of the period, bore at the head of the title-page the ownership signature of the Reverend Edward Graves Meyrick of Ramsbury in Wiltshire. Meyrick was a teacher at the school where Jane’s favourite nephew and her first biographer, James Edward Austen-Lee, had been sent as a boarder at the age of 13 – just a couple of years before Jane’s book was published. Meyrick’s ownership signature has been scored through in the second and third volumes, perhaps by a later owner, but in the year that marks the 200th anniversary of Jane’s death – and against a modest estimate of just £2000-3000 – this attractive copy was bid to £38,000. It was one of a group of Austen firsts from the estate of a deceased collector who is thought to have acquired them in the late 1950s or early ‘60s. The signed title-page of the 1813 first of Jane Austen’s Pride and Prejudice that sold for £38,000 by Mellors & Kirk. His copy of Sense and Sensibility, Austen’s first published work, was sold many years ago, it seems, but the Nottingham sale did include Emma of 1816, in a period style but much later and smarter half calf binding and lacking the half titles, at £7500. A somewhat spotted example of the four-volume edition of 1818 that brought together Northanger Abbey and Persuasion sold at £4200. It sported contemporary calf bindings but lacked the lower part of the spine of the first volume and parts of some of the spine labels. Auctioneer Nigel Kirk says the collector’s family have since sent him a copy of Mansfield Park, which will come up for sale in June.